Blazon: Barry of eight argent and vert, a griffin segreant or within a bordure azure charged with eight roses of the first seeded and barbed proper. 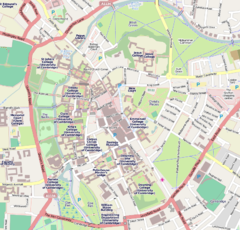 Downing College is a constituent college of the University of Cambridge and currently has around 650 students. 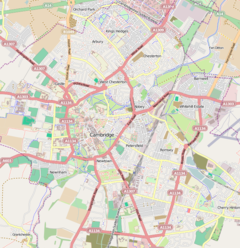 Founded in 1800, it was the only college to be added to Cambridge University between 1596 and 1869, and is often described as the oldest of the new colleges and the newest of the old. Downing College was formed "for the encouragement of the study of Law and Medicine and of the cognate subjects of Moral and Natural Science", and has developed a reputation amongst Cambridge colleges for Law and Medicine. Downing has been named one of the two most eco-friendly Cambridge colleges. Upon the death of Sir George Downing, 3rd Baronet in 1749, the wealth left by his grandfather, Sir George Downing, 1st Baronet, who served both Cromwell and Charles II and built 10 Downing Street (a door formerly from Number 10 is in use in the college), was applied by his will. Under this will, as he had no direct issue (he was legally separated from his wife), the family fortune was left to his cousin, Sir Jacob Downing, 4th Baronet, and if he died without heir, to three cousins in succession. If they all died without issue, the estates were to be used to found a college at Cambridge called Downing. Sir Jacob died in 1764, and as the other named heirs had also died, the college should have come into existence then, but Sir Jacob's widow, Margaret, refused to give up the estates and the various relatives who were Sir George's legal heirs had to take costly and prolonged action in the Court of Chancery to compel her to do so. She died in 1778 but her second husband and the son of her sister continued to resist the heirs-at-law's action until 1800 when the Court decided in favour of Sir George's will and George III granted Downing a Royal Charter, marking the official foundation of the college. The architect William Wilkins was commissioned by the trustees of the Downing estate, who included the Master of Clare College and St John's College and the Archbishops of Canterbury and York, to design the plan for the college. Wilkins, a disciple of the neo-classical architectural style, designed the first wholly campus-based college plan in the world based on a magnificent entrance on Downing Street reaching back to form the largest court in Cambridge, extending to Lensfield Road. But this was not to be. The estate was much reduced by the suit in Chancery, and the grand plans failed. Much of the north side of what was then the Pembroke Leys was sold to the University and is now home to scientific buildings ("The Downing Site"). In fact, only limited East and West ranges were initially built, with the plans for a library and chapel on the south face of the college shelved. The third side of the square was only completed in 1951 with the building of the college chapel. Where the fourth side would have been is now a large paddock (known simply as "The Paddock"), with many trees. Though not fully enclosed, the court formed before the Downing College is perhaps largest in Cambridge or Oxford (a title contested with Trinity College's Great Court). An urban legend amongst Cambridge students claims that Trinity pays an undisclosed sum to the college annually with the condition that it will never build the fourth side of the square, so that Trinity may maintain the distinction of having the largest enclosed court of all colleges of Cambridge. The most recent building additions are the Howard Lodge accommodation, the Howard Building, and most recent of all the Howard Theatre which opened in 2010. These were sponsored by the Howard family and are located behind the main court around their own small garden. These facilities are used for conference and businesses gatherings outside the student term. The Heong Gallery, opened in February 2016, is a modern and contemporary art gallery at Downing, named by Alwyn Heong, an alumnus of the college, who is a supporter of the visual arts. The conversion of a stables building by Caruso St John won a RIBA regional award. Downing students remain prominent in the University world; in the past few years Cambridge Union Presidents, Blues captains, Law and Economic Society Presidents and more have hailed from the college. It is also a politically active college, with politically active members and alumni occupying different parts of the British political spectrum, from the far left to the extreme right (Nick Griffin, the leader of BNP, went to Downing). In this sense, it is quite different from other colleges, as the student body of many of the politically active colleges tend to incline toward one party or another. Downing has a particular reputation for law. The Griffin has been the undergraduate student magazine for over 100 years. The college fields teams in a range of sports including, men's football, men's and women's rugby, tennis and Ultimate Frisbee. Downing College Boat Club is successful too, with the Women's first boat gaining Lents Headship of the river in the 1994 Lent Bumps, and more recently the Mays Headship in the 2014 and 2015 May Bumps. The men's first boat has held the headship several times in the 1980s and 1990s (for example in 1994 to 1996) while gaining the Mays headship in 1996 and the Lents Headship in 2014, on each occasion recognising the tradition of "burning the boat" (using an old wooden 8 oared boat), while the rowers of the winning boat jump the flames. They both currently hold positions at or near the top in both University bumps races [Lents and Mays]. The Paddock, the green space between the trees. The church on the skyline is on Lensfield Road. North east view of the lawns outside the chapel. The college is renowned for its strong legal tradition, being built up by Clive Parry, his pupil and successor John Hopkins and Graham Virgo. Legal notables who have been honorary fellows of the college include the late Sir John Smith, the pre-eminent criminal lawyer of his generation; Lord Collins of Mapesbury, the first solicitor to be appointed to the Court of Appeal and House of Lords; and Sir Robert Jennings, former President of the International Court of Justice. ^ "Alan Bookbinder". 2018-09-21. Archived from the original on 13 October 2018. Retrieved 13 October 2018. ^ "Annual report and Accounts for the year ended 30 June 2017" (PDF). Downing College, Cambridge. Retrieved 16 August 2018. ^ "Downing College". University of Cambridge. Retrieved 2010-09-02. ^ Chappell, Peter (16 September 2018). "How a small society of Indian Cambridge students helped destroy the British Raj". Varsity. Retrieved 18 September 2018. Downing admitted one third of all Indian students as the College’s heavy focus on Law drew many applications from the Empire. ^ "Jesus and Downing named 'greenest' Cambridge colleges". 2012-04-30. ^ "Quinlan Francis Terry Architects". Archived from the original on 7 April 2014. Retrieved 13 September 2014. ^ "Downing College Conferences & Functions, Cambridge". Downing-conferences-cambridge.co.uk. Retrieved 2014-05-15. ^ "Heong Gallery, Downing College". Retrieved 23 May 2017. ^ "Previous Campaigns – the Hopkins Parry Fellowship". ^ FaceJolt. "The Griffin". Archived from the original on 11 October 2015. Retrieved 13 September 2014. ^ Bowler, Peter J., ed. (2004). "Lankester, Sir (Edwin) Ray (1847–1929)". Oxford Dictionary of National Biography. Oxford University Press. ^ "Rubel Phillips Obituary: View Rubel Phillips's Obituary by Clarion Ledger". Legacy.com. Retrieved 2011-12-19. ^ "Amol Rajan". Archived from the original on 19 August 2014. Retrieved 13 September 2014. Wikimedia Commons has media related to Downing College, Cambridge.